Listen to CHRI and hear this! and the various GDOP events will act as a springboard to a major Christian-focussed event on Parliament Hill on 16 July. Hear about upcoming Christian celebrations for Canada 150.
will pray for them and their events, that the Lord will be raised high. contact us about being part of this event. saints for the Lord of Canada and the world. This is the event that has taken place on Parliament Hill since 2013. 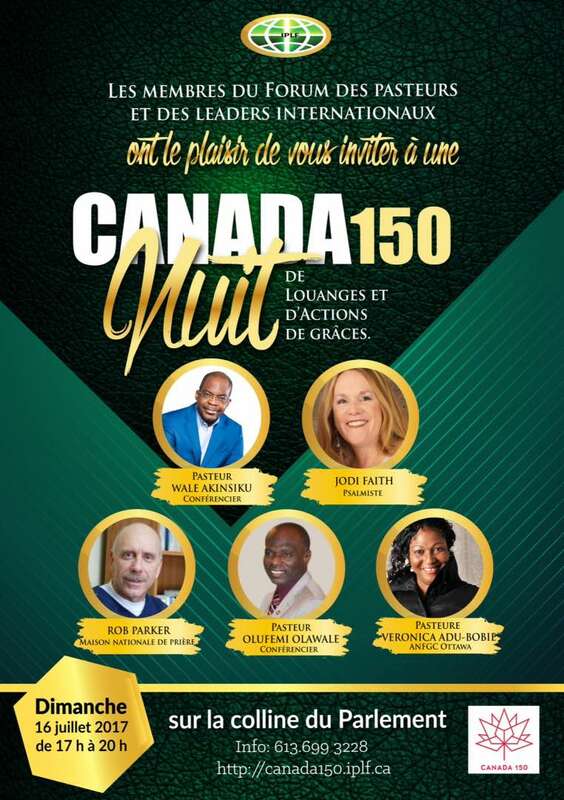 5pm 	       "Ottawa Churches Celebrate Cada 150"
All Ottawa churches will be invited. 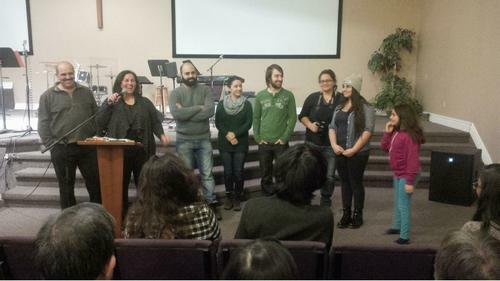 Organizing committee from One-Way Ministries. Where? 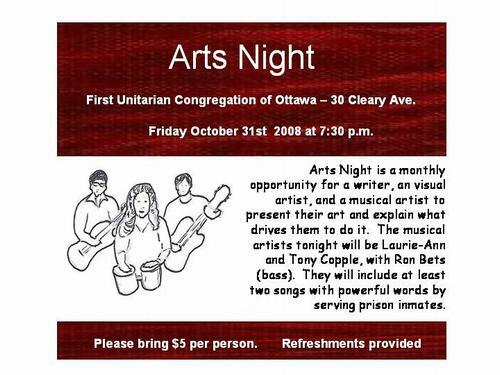 East Gate Alliance Church, 550 Codd's Road, Ottawa. We invite you to share with your congregations that this house of prayer is open from 7-9 every night for prayer and the Body is invited to gather and pray and be prayed for. Whatever the need, the Lord is inviting you to come and meet with him and his people. We are already praying and looking forward to seeing all there. Note: if any of you are prompted by the Lord to lead one of the meetings and/or lead worship music, please email Nahia. The photo shows Nahia Haddad, whose vision resulted in this house of prayer, with her family on the inaugural night. Nahia spoke about BHHoP on Over my Head on CKCU. 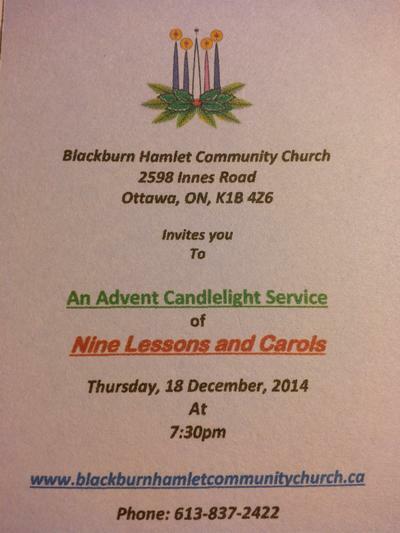 at Blackburn Hamlet Community Church, 2598 Innes Rd. Tony (I) and Laurie-Ann Copple leave Ottawa for Mozambique for Iris Global Misssion School, and Robertson, South Africa, returning end of August. You can follow our progress on Facebook. This site is unlikely to be updated while I am away. We arrived back at the end of August after a powerful 3 months of mission school followed by mission. Some elements of this time among very poor and very special people may be gauged from our photographs and videos. 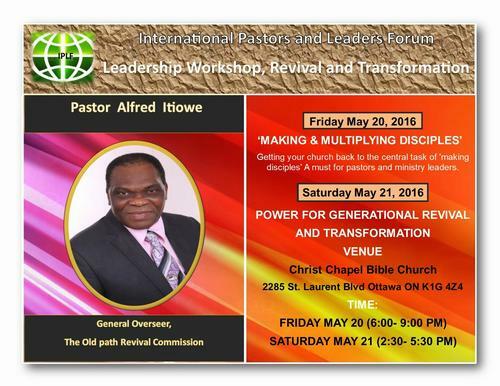 Keynote speaker: Pastor Alfred Itiowe, General Overseer, The Old Path Revival Commission. St. Timothy's Presbyterian Church, 2400 Alta Vista Dr.
Theme: "Many Parts of One Body"
Pastor Elizabeth Afolabi will speak on "You are God's treasure." The world's pre-eminent modern hymn-writers here in Ottawa! Stand up for the millions of aborted children. Join a location for 90 minutes. 5 locations in Ottawa sponsored by Campaign Life Coalition Ottawa. Listen to a Rock the Capital edition of Over my Head, CKCU, with Prosper and Melissa Laguerre. Fire and Fusion Conference - Evangelicals and Catholics together! Celebrating reconciled diversity. Photos and videos from the conference. Photos from the 2014 Fire and Fusion conference. on the IPLF Annual convention coming up in October. 10:00 am. sharp – 12:00 pm. Christ's Chapel Bible Church, A7-2285 St. Laurent Blvd, Ottawa. For more info on Burning Hearts House of Prayer see further down this page. Hear all about or 2015 GDOP on Sat 23 May, AND enjoy a cooked breakfast! Essential to register for breakfast by calling 613-591-3903 - leave a message. - How neighbourhood mapping can reveal the unmet needs and untapped resources of your immediate neighbourhood. the Lord is inviting you to come and meet with him and his people. We are already praying and looking forward to seeing all there. Note: if any of you are prompted by the Lord to lead one of the meetings and/or lead worship music, please email Nahia. After 7 years as a church operating out of various locations, Tabernacle of Prayer is ready to put down permanent roots in bricks and mortar. For this we ask our congregation and friends of our congregation to join this great adventure. It will be one night ONLY and the only opportunity to experience this concert in Ottawa on this 20 City Canadian tour. Tickets: phone 613-828-9284. $25-30 by section with some overflow space available at a reduced price. Reserve your tickets early, space is limited. Proceeds to charity. You will not want to miss this exciting and blessed event. Cost: $10 payable at the door. Join us for a stimulating, encouraging and thought provoking morning! Listen to information on Over my Head, CKCU. Location: LifeCentre, 2214 Innes Rd. 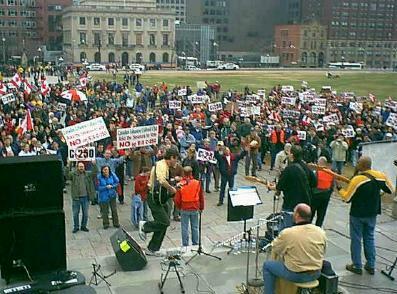 Jay Smith, of Hyde Park Christian Fellowship, speaks in Ottawa. He is an expert in Christian-Muslim apologetics. 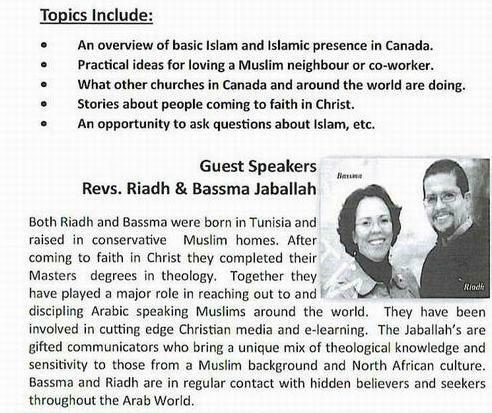 Thu 25 Sep, 6 pm - 9 at East Gate Alliance Church, 550 Codd's Rd. Trinity Presbyterian Church has moved! Catholics and evangelicals join forces in this movement, encouraged by Pope Francis. Awake the Nation - Ignite Canada! Camp sites, RV sites, cabins, etc. NB: 'Pre-Awake coming to Ottawa 20-21 June and 11-12 July 7pm, location tba, speakers John Wilkinson, Bill Prankhard. Ebomi comes to Christ's Chapel Bible Church, A7-2285 St. Laurent Blvd. Sadly, El-Buba stayed in Joss, Nigeria, which was finally admitted by the team of US-based pastors who did make the trip to Ottawa. 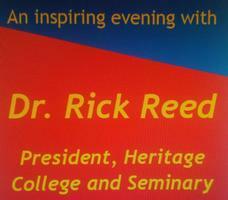 Yes Pastor Rick Reed has been enticed back to Ottawa from Heritage College for an evening to give a talk. 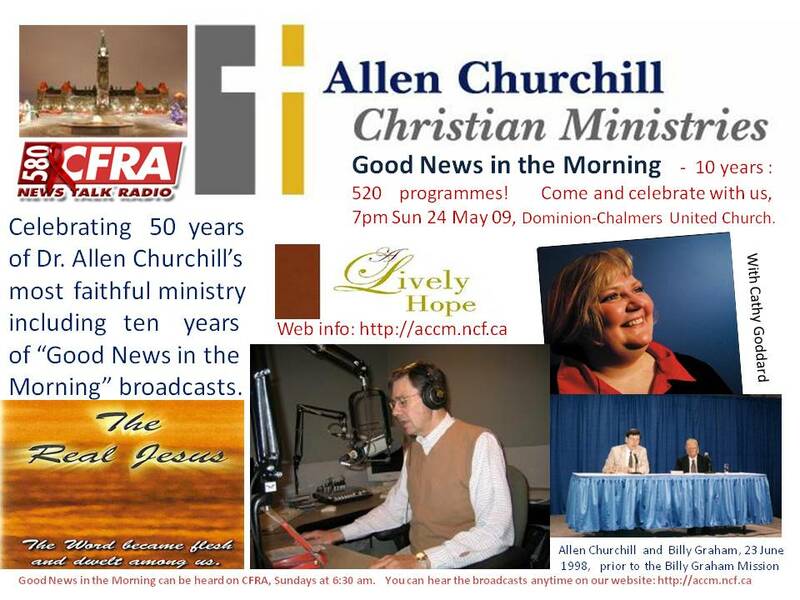 Event organized by Good News Christian Ministries who are behind "Good News in the Morning," the weeky 580 CFRA Christian radio program. $30,000+ for the hungry, hurting and homeless in our community. Home page, for overall information and awareness. Featuring renowned Canadian artist Adrian Gollner and a trio from the acclaimed violin ensemble Stellae Boreales. 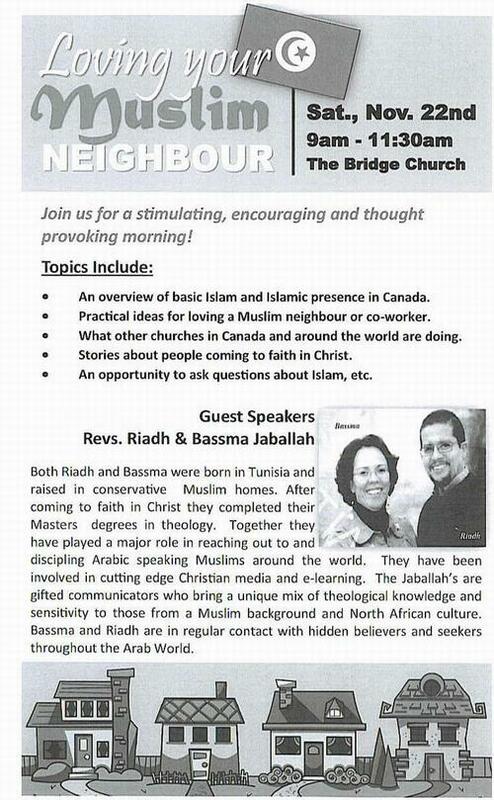 Blackburn Hamlet Community Church, 2598 Innes Rd, Ottawa. Prepare for this massive event ... It happens in your home! Sign up on the website as an individual or a church and access the on-line training. plus Alma and Dr. Allen Churchill, and chat with other listeners to the program. and proclaiming the Gospel from the same location. House of Love and Prayer Christ Assembly cordially invite you to join us in a fervent prayer for Nigeria at 53. ROCK THE RIVER is Coming BACK to Ottawa Saturday 28 September 2013. Don't miss all the live action! 6pm – 10pm: Live performances and inspirational speaker Bob Lenz. Where: The Met Bible Church (doors open at 5pm). FREE Admission. Just like a garage sale but everything is free! Please bring your merchandise from 4 - 8 August. No electronics please! Community Bible Church welcomes you to join us for Camp Kingdom Rock - where kids stand strong for God! This full day, full week summer experience, open to kids graduating JK to Grade 5, will be filled with music, drama, crafts, games, snacks, outdoor activities, and most importantly, daily messages about a God who loves us and how we can stand strong for God and our faith. Registration is open now but space is limited, so don't wait! See www.cbcstittsville.com or 613-836-2606 to register today. What difference can I make to the Kingdom of God? The event is free, and a good-will offering to support the work of ARM will be gratefully received. or visit the ARM website: www.armcanada.org. Take some time this month to check out the stunning and thought-provoking photography exhibit “Too Young to Wed” which is intended to bring awareness to an important international element of Canadian foreign policy: advocating against the practice of early forced marriage. As the original and host peoples of Canada, we are calling all leaders, spiritual fathers and mothers, and the young generation to stand together for God’s standards. We believe, as we praise, worship and intercede, and share our hearts together; we will rebuild, restore and renew all that has been devastated in our people and nation. We must arise, shine and stand firm as a people and nation under God! Summer Splash is a mostly free day at Logos Land splash park. Admission is a non perishable food item or $2 per person. Splash passes (mini-putt, water trampoline, paddle boats, waterslides, splash pad) and zip lining are available at a discounted rate ($5 for splash pass, $10 for zipline) but the freebies include: music, games & prizes, beach, face painting, petting zoo, hiking trails & parking. Pack a picnic lunch or buy lunch on-site. Centering around Jesus Christ, Christos Story tells the story of the world before and after His coming. With his coming, the once broken relationship between God and humans is ultimately restored brining hope to the world. Through the combination of affective live acting and innovative audiovisual presentation, Christos Story goes beyond sharing the passion story of Jesus Christ to recount the biblical events of God’s action from the story of creation to the ascension of Jesus Christ. Christos Story is normally presented during the Easter time. Admission is complimentary and since its start in 2007 Christos Story has presented the message of the gospel to more the 5000 viewers in Arabic and English. Wed 5 June 2013, 7:30 - 9:30 pm. We all have a Love Language - come & learn your love language and how to identify the love languages of others in your life. We’ll explore Christian counselor Gary Chapman’s work on the Five Love Languages in an interactive and fun evening. When: Leadership Dinner: Monday, June 3, 2013 – 6:30 p.m. – 9:00 p.m.
National Prayer Breakfast: Tuesday, June 4, 2013 - 7:15 a.m. – 9:00 a.m.
Paul recommends being "filled with the Spirit, speaking to one another with psalms, hymns, and songs from the Spirit"as an alternative to getting drunk on wine. We highly recommend joining the conversation with Ernie and the London Trio +. Although the Reverend Ernie Cox has retired from church leadership, wanting to make his music accessible beyond Sunday mornings, he'll be putting on his reverend hat to offer a reflection to lift the heart and mind and inspire us all. Join us. Jazz Vespers is a very present form of a very ancient tradition. From the earliest days of the Christian church, there has been some sort of reverence made to mark the end of the day. The name Vespers began to be used as long ago as the sixth century. Today, Vespers is a time when people can gather to chase away the shadows of the coming night or the day that's been; seek comfort and sustenance; renew energy for the coming days; or find peace for an hour or so from an all too present world. Come and be moved, comforted, uplifted, outraged, or whatever else you may need. And come hear how these musicians interpret the centuries. 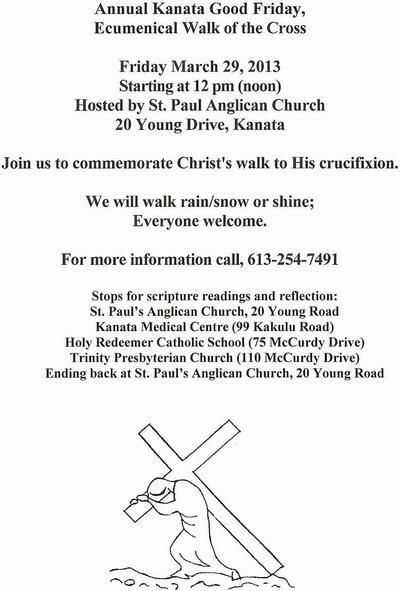 The Kanata Stittsville Refugee Sponsorship Group presents Big Soul Project (large gospel choir) in Concert at St Paul's Anglican Church. You can check ‘em out in advance at bigsoulproject.com. entitled, "Readability or Reliability: Are Bible translations trustworthy? The speaker is Dr. David Lyle Jeffrey. Poster. Please print the poster and display everywhere! Designed to encourage and envision men to reach for all that God has created and called them to be. Start your Easter Day right! Come to meet others with the same passion to cover our city with prayer. Pray Ottawa.ca to find out more. Sun 30 September 2012: Rock the River: Family event With Franklin Graham, Michael W Smith, Sebastian Demrey, Canton Jones, L'Angelus, The Afters, Matt Mahar, and Lacy Sturm from Flyleaf. With Franklin Graham, Thousand Foot Krutch, Lacey Sturm from Flyleaf, Prosper & GPM, Dennis Agajanian, The Afters, Flame, and The Almost. Community Action Project, CAP, for Rock the River. Looking for at least 150 youth to assist with improvements in affordable housing projects. This 3-session training will equip you to serve as a counsellor at Rock the River, reignite your faith, and find power to live a life that radiates Jesus' love. Come and hear about the course (22 May - 9 June 2012) and enjoy breakfast on us. 8:30 - 10:30 am. 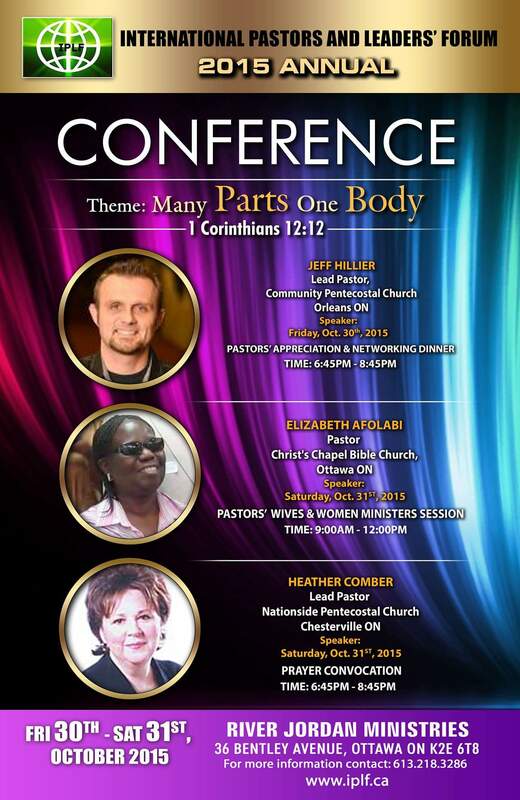 Location: Community Pentecostal Church, 1825 St. Joseph Blvd., Orleans, ON. 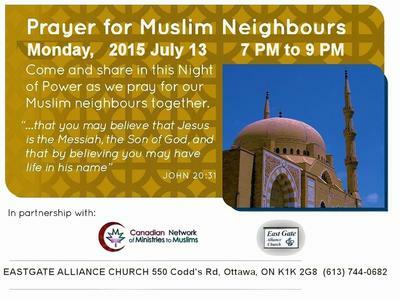 at the National House of Prayer, 17 Myrand Avenue, Ottawa. 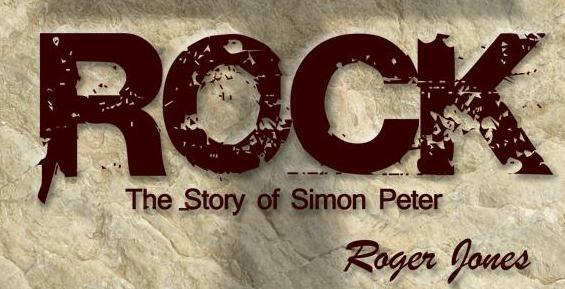 You're invited to "prepare the way" in prayer for Rock the River Ottawa. 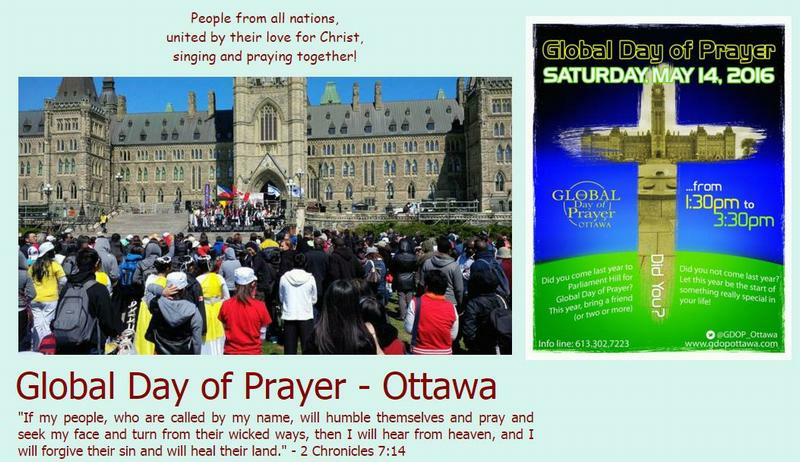 Partner in prayer together for Ottawa/Gatineau and for more 'laborers for the harvest' to engage in prayer through a '5000-people prayer challenge'! More than 900 young people, including youth pastors and leaders packed the Youth Launch event on February 10. The band "Nine-O-Five" led worship preparing hearts for speaker Mark Miller's "give your all to Jesus" message. 225 youth took the challenge seriously and committed or recommitted their lives to Jesus Christ. One youth posted this on RTR's FB site: "Tonight was a blast, I'm willing to follow him anywhere." Speaker: Will Graham, grandson of Billy Graham. Registration 8:30 am. Free. Lunch included. This was preparatory to a 2-day outreach Sept 29 & 30 focusing on reaching the next generations. Making a difference outside the 4 walls of the church. On this evening, Ottawa will be walking for Jericho Road Ministries - brave the cold, wind and snow and join your friends and family while raising $25,000 for the hungry, hurting and homeless in our community. Home page, for overall information and awareness, and donations. If you would like to learn how to run The Parenting Course in your community or church, this seminar is for you. 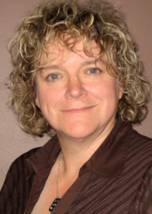 Elaine Young is the presenter, head of Relationship Central for Canada, part of Alpha Canada. It's "Back to Church" Sunday! This is the Sunday you can most effectively invite your friends who no longer attend church to come back. B2CS started in 2004 as the initiative of Michael Harvey, a layperson in the Church of England. Since then, more than 80,000 have come back to church. More and more churches are joining the initiative. You are invited to a special spring event to celebrate Good News as Rev Dr. Allen Churchill and Rev. 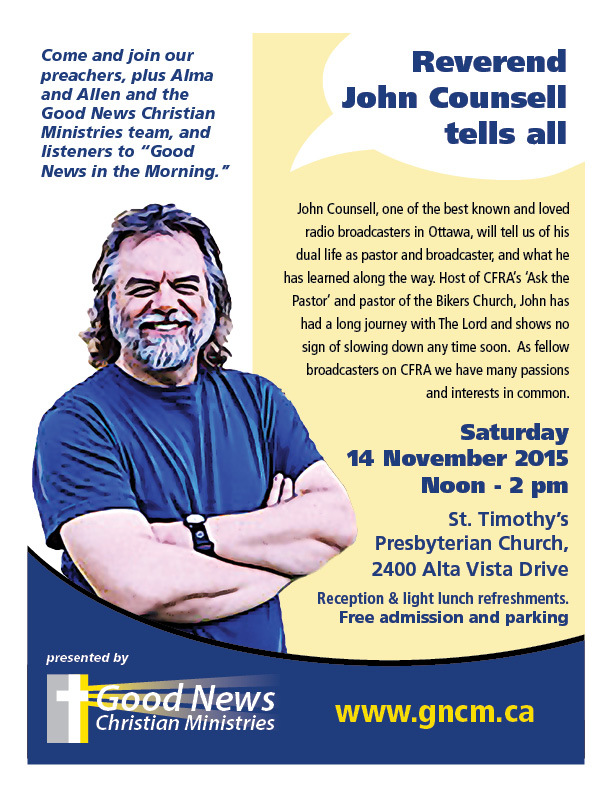 Don Crisp, and Good News in the Morning listeners, share testimony, in the company of anointed singers and musicians. EPIC, Endless Possibilities In Christ, for grades 5-12. Theme: from Timothy 4:12: "Don't let anyone put you down because you're young. Teach believers with your life: by word, by demeanour, by love, by faith, by integrity." It is a message that both challenges and empowers the youth of St. Paul's to seek out God's will and to do it wholeheartedly. Discovery Café - Dr. Chris Waddell, Director of the School of Journalism and Communication at Carleton University, spoke on "Can you believe what you read in the newspapers?“ - which he broadened to an informative survey of recent trends in the volatile world of journalism in Canada. It was very well attended, and much appreciated by all. This was the final Discovery Cafe for the time being, but it will return. 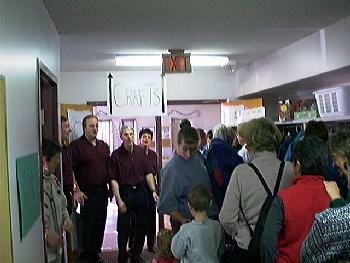 Blackburn Hamlet Community Church is in a shopping mall between a bank and a pub, and is a member of ANiC. The café aspect of the evening was extremely delicious. Bravo BHCC, and thank you Dr. Waddell! PLUS: Are you funny: Your chance to get up on stage with Leland and prove it. Parkdale United Church is celebrating 80 years of ministry in 2011! Come and enjoy an evening of singing and inspiring music. Special musical performances by Ernie Cox and Lynda Cox, Parkdale’s Choir and Worship Team, Terri-ann Priel, Rosemary Kimberley and others. The audience will have the opportunity to choose the hymns we sing together. Please join us for this inaugural anniversary event. Free Admission. The Ottawa School of Theology & Spirituality is announcing our upcoming courses. The Winter Term begins on January 10th and runs for 10 weeks. We offer exciting, informative courses on topics related to faith and spirituality in a relaxed, friendly environment. Our School is officially sponsored by the United, Anglican, Presbyterian and Roman Catholic churches in Ottawa. For information about the School and its history as well as current course offerings, please visit our website at www.osts.ca. Would you please include the following announcement in your next email to your Diocesan Lists? "The Ottawa School of Theology & Spirituality is in its 47th year offering courses on spiritual and faith topics. Winter Term runs from January 10th to March 14th, 2011. Choose two courses for only $60. Visit www.osts.ca for course outlines and registration or register on January 10th at 7 pm at All Saints' Anglican Church, 347 Richmond Road, Westboro. For more info, call 613-824-8780 or 613-726-2089." Thank you very much for supporting the Ottawa School of Theology & Spirituality. Kick off the festive season with a special concert of live music, drama and Chistmas spirit. A free-will offering will raise funds for Angel Tree prison minstry and other causes. Program directed by Kathy Blakely, who brought you the Singing Christmas Tree at Bethel Pentecostal this past 10 years. -Faith and a Secular Age: Implications for Christianity and Islam. -The Coming Global Christianity: Mission, Persecution, Growth. Free admission. A free will offering will be collected in support of our Mission, Outreach and Justice programs. 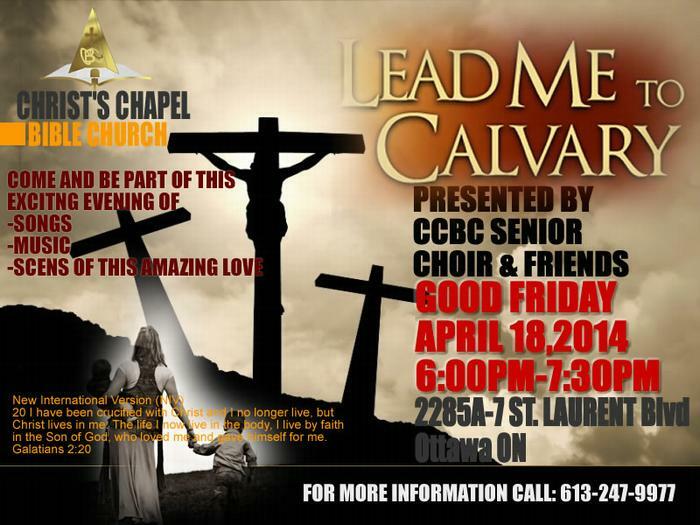 Good News Christian Ministries invites you to a special evening with The Rev. Dr. Allen Churchill and The Rev. 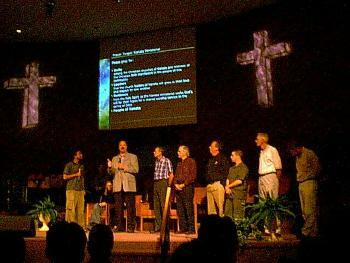 Donald Crisp, Partners in the Gospel, as they celebrate joining forces to present Good News in the Morning. 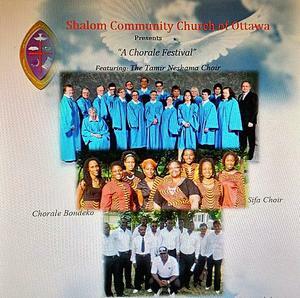 Special Music by Ernie Cox and Vanessa London, and the Ottawa Christian Chorale. Poster. Please print and take a copy to your church! 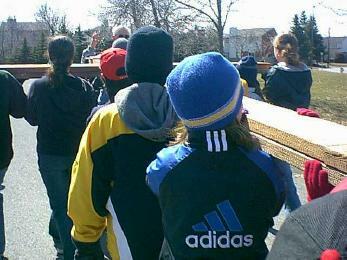 Report: The presence of God overflowed into Arnprior on Saturday at the “Youth Explosion”. The place (River of Life) was filled with young people and overflowing with the glory of God. Shawn Gabie whose life was radically changed by God as a youth gave a powerful anointed message. The Lord dropped a bomb of His glory at the end of the service and changed so many lives. Many reported being healed and set free from addictions. One girl after receiving salvation was healed of chronic lower back problems. That night she touched her toes for the very first time in her life. The greatest miracle was seeing 20 youth making decisions for Christ! The bible says that all heaven rejoices over one soul. Last weekend there was a big party in heaven. How much: $10 by Nov 9; $20 after; Youth (19 and under) $5. One event, 4 locations, linked by technology. Call Pauline at 613-591-3469 and we'll send a team of workers to help you. Saturday 29 May 2010, 7 pm. 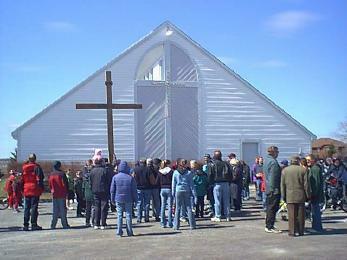 Sunday May 30: St. Mary's, 2574 6th Line Road, North March, Celtic Outdoor Eucharist - 11 am, led by Rev. Ray Simpson. Ray Simpson is the Guardian of the Community of Aidan and Hilda: an international community centred on the Holy Isle of Lindasfarne, U.K.. This will be the culmination of a major cross-Canada initiative gathering the First Peoples to (hopefully) offer forgiveness to all immigrant Canadians (that's most of us) for what we have done to their land and their people. It responds's to the plea by Stephen Harper on behalf of the Country in 2008, asking the First Peoples for forgiveness. Join the largest group of people ever gathered on the same day for a common purpose of prayer. 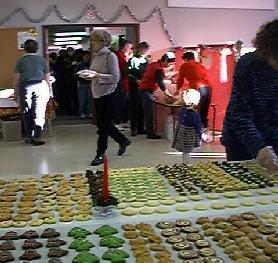 There are nine locations in the Ottawa Region where you can participate. Tony (KLF) and Laurie-Ann Copple (St. Paul's), and Dwight MCdougall (KBC), plus Richard Gilman (St. George's, Metcalfe St.) will be in Sierra Leone from 19 April - 3 May as visiting speakers at two four-day Global Alpha Training conferences in Freeetown, showing how to run Alpha courses and Alpha conferences to spead the Gospel using Alpha as the tool. Your prayers and financial support are requested, if you sense the call. Register: Leave your name and tel no at 613-592-5310. 30,000 BOOKS FOR SALE !!! Kanata United Church , 33 Leacock Dr. , will be holding its annual book fair on Friday, Feb. 26th (6-9pm), and Saturday, Feb. 27th (9am – 2pm). Worship service begins at 7:30 pm. This seminar will focus on developing competence for Intercultural Ministry. Skills can be applied to serving in Canada or in overseas missions. Movie in the open air, sponsored by Kanata Lakes Fellowship. On this night we watched the movie Fireproof in the Beaverbrook Centre parking lot, right opposite the Teron Road fire station. Free show, with hot choc and snacks. This film is one of the most popular Christian films of all time and a wonderful marriage-strengthener. About 20 turned out and were blessed by the experience. Dr. Selwyn Stevens is a best selling author (4 of his 20 books) on cults and the occult, including freemasonry, an international speaker and ordained minister. He is also the Apostolic Overseer of the Alliance of African Christian Churches and ministries in Zambia and has helped start dozens of churches. All are welcome, please invite others to join us. You will not be disappointed. Billy Graham Schools of Evangelism: "Reconnect with your calling"
A retreat focussed on exploring local church evangelism that will work in your community today. It's designed for pastors, church leaders and their spouses, with special attention to the needs of medium-sized and smaller churches regardless of denominational affiliation. Start your Canada Day off with God, and feel the true joy of a citizen of this anointed nation, coming together in praise and worship with brothers and sisters in the Lord. Hi Folks, We need your help to have fun. Please put the word out that on the last Saturday of June the community of Clayton will be hosting a Scoff and a Scuff (this means dinner and dance) at the Clayton Community Hall. Dinner and dance $20.00 each. The meal will be salt beef, cabbage, peas puddin', carrots, turnip, parsnip, potatoes, blueberry duff and turkey. The tickets can be purchased through me and the funds are being raised to renovate the community hall. There will be skits and music and lots of fun, maybe even a few mummers ( a few what's?) Of course it has to be fun with a bunch of Newfs around, right! Don't worry about the mainlanders they'll have fun too. Right! All are welcome, to the best of my knowledge there will be 200 tickets printed and we would like to have them all sold prior to the event. 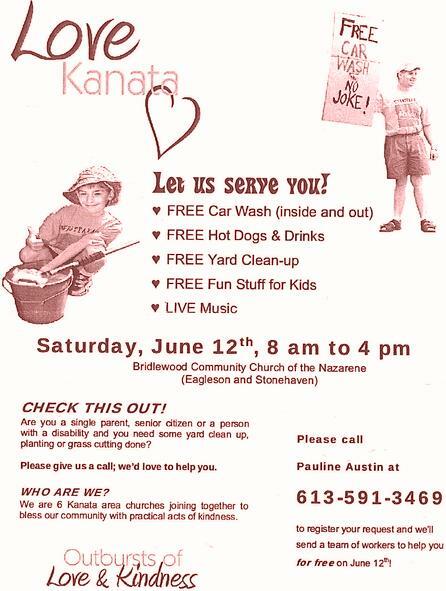 Sat 13 June 2009 - All over Kanata. Need help? Give help! Between these two dates six speakers will give a total of nine faith talks under the heading: The Church: A Gift in Christ. The speakers are: Dr. Edith Humphrey, Rev. Dr. Jo Bailey Wells, Rev. Dr. Ephraim Radner, Bishop John Baycroft, Rev. Canon John Bridges and Rev. Craig Bowers. Registration appreciated as soon as possible! at thousands of locations worldwide, including City Church, Vanier. 5-min video Join millions around the world in a global cry to God. For prayer venues, click the day. Allen Churchill Christian Ministries invites you to join us at Dominion-Chalmers United Church. 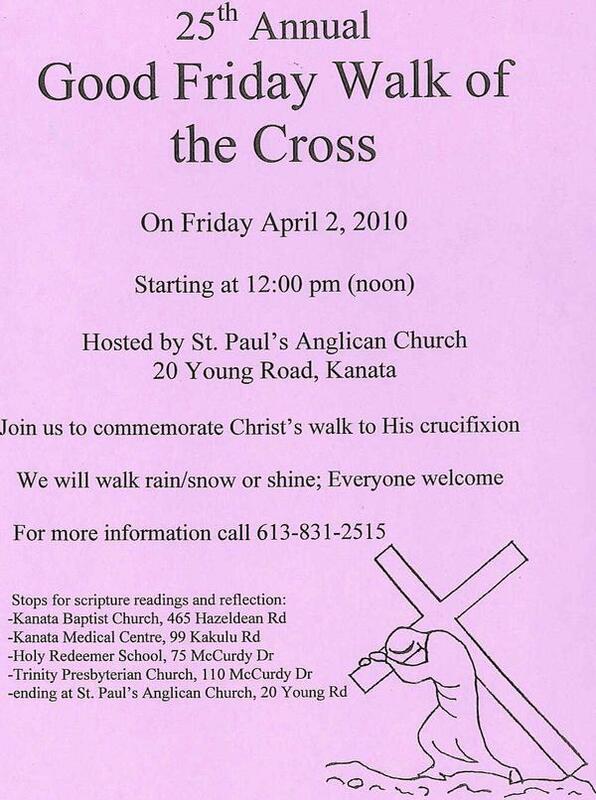 On May 14 at 10 am, there is a Mass at Notre Dame Cathedral, a prayer service at St. George Anglican Church and another prayer service hosted by the Canadian Reformed Church at Merivale United Church (1876 Merivale Road) on Thursday May 14, 2009, at 9:30 am. 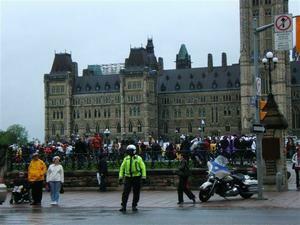 At noon, the gathering begins on Parliament Hill where the dignitaries will be introduced. The march, which lasts about one hour, will begin at 1:30 pm. 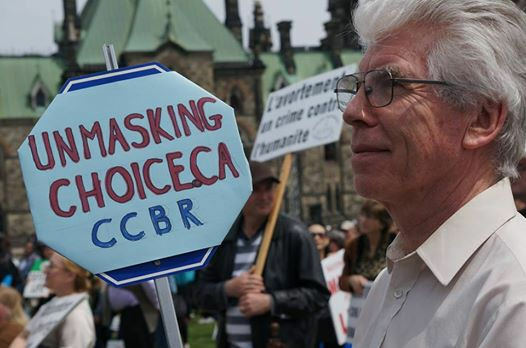 At 2:45 pm, the Silent No More Awareness Campaign will have men and women who regret their abortion or involvement with abor-tion make presentations about their harmful ‘choice' and at 4 pm there will be closing prayers on the Hill. That evening at 6 pm, there is a cocktail hour before the annual Rose Dinner where the featured speakers will be former Liberal MP Tom Wappel – the "Dean of the Pro-Life Caucus." Saturday 2 May 2009, 7 p.m. This year's Glen Cairn United Church Annual Show is an evening of entertainment and song commemorating the the 40th anniversary of GCUC. As it happens, Sesame Street is also 40 years young this year, and some of the Sesame Street Stars - including Kermit the Frog and Oscar the Grouch - have agreed to come and help us celebrate. Mama Cass and Abba will also be there. 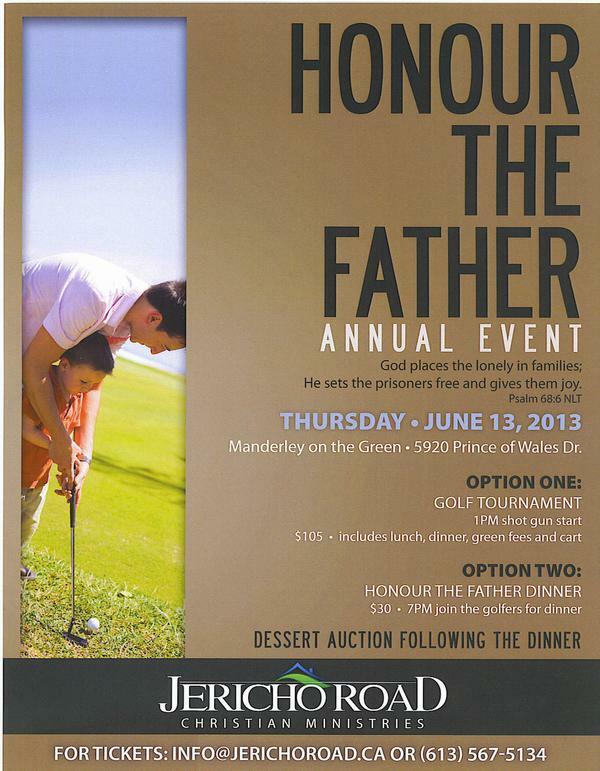 Tickets: $10, or $30 per family, from 613-836-4756, or by e-mail from office(at)gcuc.ca, or at the door. The Hope in Crisis seminar. Is our church prepared for a crisis in our community? From wide-scale environmental devastation to traumatic social issues, the spiritual presence of local churches is critical for community members facing fear, loss, and loneliness. Rapid Response Team Training • Friday, April 24 • 7:00 pm • Saturday, April 25 • 9:00 am • The MET. Provides training for lay "chaplains" who can assist folks in a natural disaster or crisis in the community. All are welcome. There is no charge. L'Expérience is a 40 x 30 foot three-dimensional art installation that touches our five senses. With the collaboration of many artists and over 100 people from across Canada, this interactive exhibit has been created to "re-introduce" God to people and to encourage believers. All night prayer vigil including activities to help us stay awake, including a walk to the crosses at "Jerusalem" shortly after sunrise. This year, the Kanata Community Alpha held its Alpha course Introductory Celebration in the Cheshire Cat Pub, 2193 Richardson Side Rd / Carp Rd. Earlybird (by 5 March): $55. PLUS silent auction, musical entertainment, and magician ELLIOTT SMITH. Cost: $15. Children under 11: buy a full price ticket but receive $5 cashback at the event. You are warmly invited to attend a Glen Soderholm concert at 7:30 pm on Saturday November 29th at Trinity Presbyterian Church, located at 110 McCurdy Drive in Kanata . Glen is a Canadian singer/songwriter with exciting musical talent and a delightfully warm presentation style. Tickets just $15 each! For info and tickets call 613-836-1429. DON'T MISS IT! For sound bites visit www.glensoderholm.com. A. The foundations of worship - what people need to be able to worship God in a manner which is both pleasing to Him and helpful to us. B. The basics for "Practical Expression" of worship leading - how we can practically and simply lead worship in a helpful and relaxed manner. C. The big picture - The ultimate goal of worship leading. If you would like a poster for your bulletin board, tickets to sell, or a demo CD, please contact Ellen Whittingham at 613-820-3700, and she will drop them off. Hosted by City-Wide Worship & Prayer at Scotiabank Place, this year's focus is "First Things" - those things which the Bible tells us are the most important - loving God and loving others… Join with thousands of believers to worship our Lord - celebrating God's work in our city and praying for the Church across the National Capital Region. New this year - The Children's Gathering *for kids age 5 to grade 6. For more information visit City-Wide Worship & Prayer at www.worshipandprayer.ca, e-mail info(at)worshipandprayer.ca or call 613-612-6065. There is no admission charge, and parking is free. You may have heard the news coverage, now you can hear the couple. John and Eloise Bergen, missionaries with Kelowna-based Hope for the Nations who were brutally attacked at their Kenyan farm, say fear will not stop them from returning to Africa. "I know why I'm alive today. I'm not alive to stay home and fossilize. I have to go and finish the job," John declared. When: Thursday October 30th at 7:30 p.m.
National House of Prayer: 3rd Anniversary Celebration Open House! The National House of Prayer invites you to join us in giving thank to God for this amazing ministry centre for the Nation. On October 15th from 2 pm to 8 pm. our doors will open for this special event so that you can meet the team, tour the house and learn about all the different activities of the National House of Prayer. Since it will be the day after the election, there will also be the opportunity to pray for the newly elected Members of Parliament. Join us this day to intercede for our nation and its leaders and also to meet Pastors and Christians from the region. If you can't attend this celebration, we invite you to visit our Website or subscribe to our weekly prayer bulletin at www.nhop.ca. 29th Annual chicken BBQ, organized by St. Paul's Anglican Church, 20 Young Rd. Eat there or take home. 1. To dedicate a portion of your Sunday morning service to specifically pray for Canada and at least one elected governmental leader. Please check out our resources on this page or on our website. 2. To participate in the Toonie Offering. This one time annual donation supports the ongoing ministry of daily strategic prayer in the House of Commons, the Senate, crucial committee meetings and ministering personally with Parliamentarians. This Canada Day, NHOP joins the Christian & Missionary Alliance for two special events. On the evening of July 1st we will be hosting at the National House of Prayer (17 Myrand St.) an evening of prayer for Canada from 7:00 - 9:00 P.M. Participants will be able to walk to the fireworks display from our location. 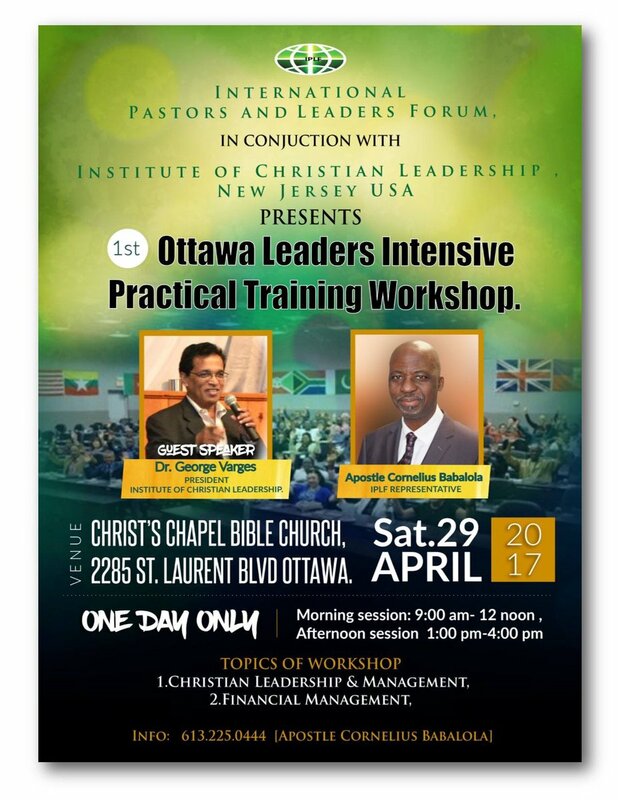 Then the next day on July 2nd we would encourage you to send your prayer leaders to a Transformational Prayer Seminar at the Ottawa Congress Centre led by Arlyn Lawrence. Would you consider forwarding this announcement to your people and/or posting this information on your bulletin board? Bishop Malcolm is Bishop Suffragan and territorial Archdeacon (Prairies) for the Anglican Network in Canada. He is also a director of Anglican Renewal Ministries and a former ARM Ambassador. Sat 31 May, 7:30 PM. Bishop Malcolm will speak on "The person, power and release of the Holy Spirit." Where: Glen Cairn Community Centre, 182 Morrena Road, Kanata. Light refreshments. Heavy anointing. 10:00 am. Bishop Malcolm will preach at Kanata Lakes Fellowship. 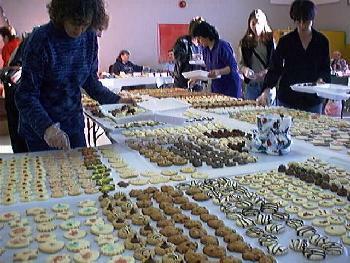 at thousands of locations worldwide, including Dominion-Chalmers United Church, Ottawa. 22-24 April 2008 Guatemalan Christian leaders to visit Ottawa. Prepare to wonder at God's work! We have planned to spread them around the city in the evenings to maximize their impact and then to meet with local leaders or student groups during the days. If you would like to connect with them please call Ken Hall (613-257-4805, cell 613-724-8313). Coffee time with them at Greenbank Community Church at 3 p.m. Tuesday, April 22. All Pastors and leaders are invited. Meeting for the west - Tuesday, April 22, 7:30 p.m. West Ottawa Christian Community at The Celebration Centre 3123 Carp Rd. Meeting for the centre - Wednesday April 23, 7:30 p.m. Greenbank Community Church, 51 Greenbank Rd. Join us at any or all of these locations. PLease send this to others you think might be interested. We expect to cover expenses through offerings at the meetings. Bruxy Cavey, author of "The End of Religion - Encountering the Subversive Spirituality of Jesus", will present material from his book. Q&A will follow. Bruxy Cavey is a popular speaker, author, and teaching Pastor of "The Meeting House", a multi-site church based in Oakville, which plans to launch an Ottawa site later in 2008. The Anglican Gathering of Ottawa announces a public meeting where Bishop Don Harvey, moderator of the Anglican Network in Canada will speak. The meeting will be at 7:30 pm at the Sandy Hill Community Centre, 250 Somerset St. East near King Edward. Parking entrance on Sweetland St. For information see www.anglicangathering.ca, or call 613-591-3903. Serving the people of the area, and would-be faithful Christians from anywhere. Two more public meetings in the region are slated following the ANiC conference in Burlington 22,23 November. You will receive reports on the announcements from Burlingon on the way ahead for biblically faithful Anglicans. 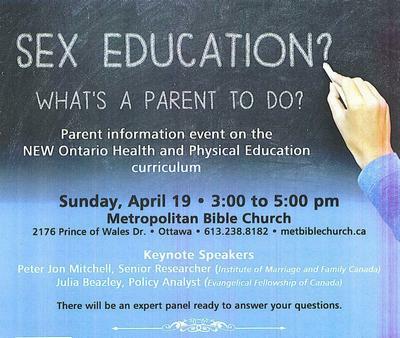 If you have concerns and questions about the liberal direction of the Anglican Church of Canada, please attend. 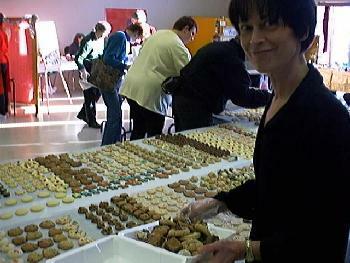 Ottawa location: The Assembly Hall in the McNabb Recreation Centre, 180 Percy St. off Gladstone. Pembroke location: The Best Western Hotel, 1 International Drive, Pembroke. This is visible from Hwy 17. Directions: Turn east into Pembroke on Highway 41 (traffic light intersection at Highway 17); take the first left (International Dr), then take the first left to turn into the Hotel's parking lot. Ottawa: Sunday 9 December, 7:30 pm. Pembroke: Monday 10 December, 7:30 pm. Roy Fawcett of Fawcett Organs in Winchester Ontario is providing a 3 manual Organ just for the Concert. Shaken by the Synod vote? 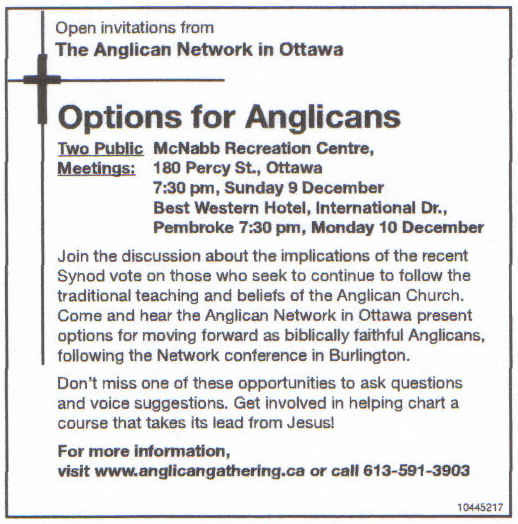 The Anglican Network in Ottawa announces a meeting organized by local lay leadership to discuss the implications to biblically faithful Anglicans of the recent Synod vote. The Gathering Hosted by City-Wide Worship & Prayer at Scotiabank Place. What would happen if thousands of Christians gathered to pray in unity in support of the local Church? Do you think it might have a positive impact on your ministry and efforts to reach the lost? And what would happen if Christians joined together to serve some of the most needy in our midst? If everyone pitched in just a little bit, would we see a glimpse of how God wants us to operate as His Body? Would it lead to more effective and efficient ministry? Would it help capture the attention of a hurting world that seeks answers and truth? The Gathering is a chance to create an opportunity to experience it firsthand, and gauge the answers ourselves in the months to follow. An offering will be taken to help support Jericho Road Christian Ministries, a wonderful front-line organization bringing hope and healing to Ottawa's disadvantaged. There is no cost to attend this event and the parking is free. Bulletin inserts and a promotional DVD are available. Simply send your request for materials to: linda@worshipandprayer.ca and the City-Wide team will arrange for your materials to be delivered. Come to Capital City Church to see Jerry Savelle, known around the world for "talking people into winning"
The Pakistani Dinner at St. Paul's Anglican Church - Chicken korma, potato-pea curry, Punjabi meatballs, etc. Start time: 6 pm. Tickets - $15 - are available from the church or via e-mail. This dinner is in support of Laurie-Ann Copple's second ministry trip to Pakistan 19 Dec 07 - 2 Jan 08. She will then make a pilgrimage to Lindisfarne in UK till 6 Jan 08. See report on Laurie-Ann's first visit to Pakistan January 2006. A South Asian fashion show and high tea is being held at St. Paul's at 3pm Sun 25 Nov, also in support of L-A's Pakistan mission; tickets $5. 6:20 pm at the Mlacak Centre. Anyone in the community is invited - bring your friends. For more information or to register, call Lynn at 613-521-5310. The Kanata Community Alpha course runs on Tuesdays from 9 October to 11 December, 2007. Handling your Sword Beginning of 12 week course (Mondays) at National House of Prayer, designed to help intercessors accurately handle the word of God as they seek to be Biblical and effective in their prayers. Where: Cambodian Evangelical Fellowship of Ottawa, 889 Watson Street. When: 1 pm to 5 pm. Light dinner served. Register at missions@mattandnary.com or call 613-795-8594 by 26 Sept. If you have ever been interested in missions locally or globally, please plan to attend. Best selling author and fighter against freemsonry, Selwyn Stevens is not to be missed, particularly if freemasonry is in your family. Where: 161 Greenbank Rd., Suite 150, on the Southeast corner of Greenbank Rd. 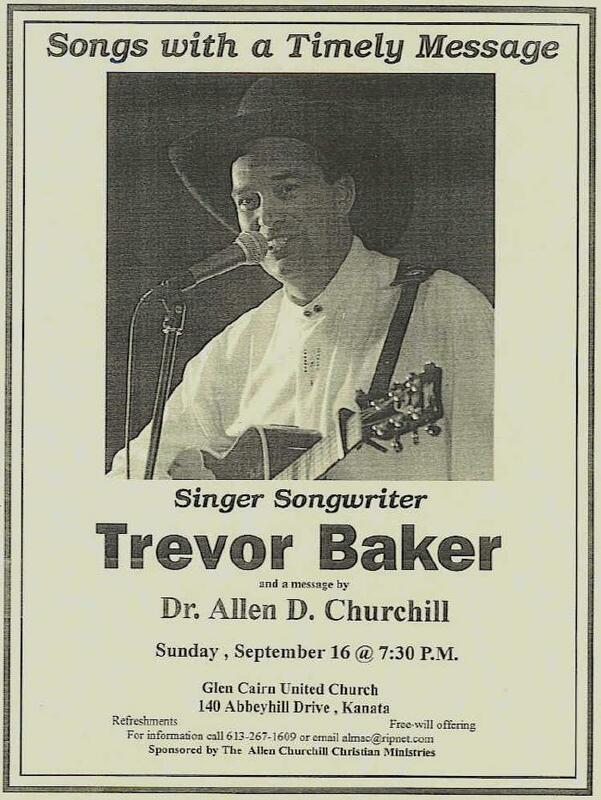 and Craig Henry Dr.
Allen Churchill Christian Ministries presents Christian country artist Trevor Baker in concert in Ottawa - Kanata at 7:30 on Sunday evening 16 September 2007 at Glen Cairn United Church, 140 Abbeyhill Drive, Kanata. Free will offering. Trevor is Christian country artist whose songs bear messages of hope and warning for our generation. He will make you think and he will help you understand. Where: Air Canada Centre, Toronto Representatives of nearly eveny nation will gather to worship with abandonment and to promote a spirit of humble, multicultural unity. Fully endorsed by Global Day of prayer. An afternoon of Singing Together some of the greatest hymns ever written. Wednesday, September 12, 2007 From 1:15 - 2:15 pm. Singing - No Charge. Optional 12 pm - Noon Lunch - Tickets $7.00. Lunch Tickets (limited) - Call early - 613-226-1383. 500 Viewmont Drive, Nepean, ON - KE3 7P2 - BUSES WELCOME! A call to join a battle for our Canada. The call is great. The youth are in crisis. We must stand up now and fight for the glorious future that God has promised us, otherwise, our youth and our nation will be lost forever. God is looking for people who are willing to be hinges upon whom He can turn Canada back to Him. Do we love Him enough to pay the price? Father's Heart Ministries hosts a "Seeing God" seminar with International Speaker Dan Thiessen. There: "Who we perceive God to be determines how close we get to Him". Concert donation: $5, or $10 per family. 23 May 2007 Change '07 with Delirious? The Friday evening program particularly will be of great benefit to any Christian family, and is geared towards equipping and strengthening Ottawa Families. St. Paul's is hosting a seminar April 12, 13, 14, open to all, entitled "Healing of the Whole Person." This seminar is designed to provide a deeper insight into healing and to create an awareness of God's call to all to become channels of His healing love. The seminar provides foundational principles and an understanding of our relationship with God, with others and with ourselves. It also provides the necessary steps to reclaim and maintain these essential and vital relationships to promote a more healthy and effective Christian life. It will be led by VINA SWEETMAN, President and Founder of the ISAIAH 40 FOUNDATION and by members of the Foundation team. 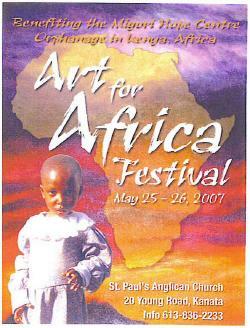 The Isaiah 40 Foundation is a Christian organization centred in Montreal. It supports a Christian ministry of Prayer, Counselling and Teaching in the areas of healing and personal wholeness. For more information on the Foundation, the President/Founder, the Team and their Work, please go to www.isaiah40foundation.org. This invitation is open to anyone who would like to attend from any community and/or church. In the next couple of weeks, there will be more details about the seminar and we hope you will feel inspired to attend. Leader: Vina Sweetman, President and Founder of Isaiah 40 Foundation. Presented by Mission Ottawa/Outaouais. See the pictures and hear some worship. 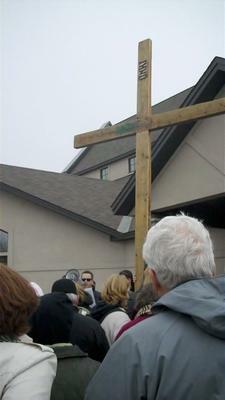 Easter Sunday Sunrise Service at St. Paul's Anglican Church, Kanata. Bethesda Renewal Centre Annual Virtual Holy Land walk. Come any time between 1 and 4 pm. A guided walk will commence at 1:30. The walk takes about one hour. We will stop at each ‘city' for prayer. Wear boots and clothing appropriate for the outdoors. Hot chocolate and hot coffee available after the walk. See the Virtual Holy Land map. Good Friday Service at Bethel Pentecostal Church. Guest speaker: Rev. Dr. Allen Churchill. There is no charge for the weekend, but a love offering will be received. 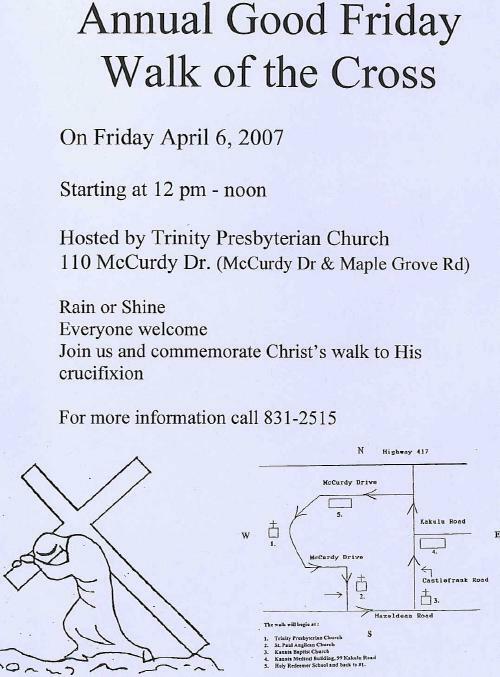 Saturday 31 March 2007, 11:00 a.m. to 4:00 p.m.
Lenten Quiet Day led by Bishop Donald Harvey, the day before Palm Sunday. See poster. We encourage readers to print the poster and post on church noticeboards. pdf version. Roger Jones at St. Paul's Anglican church: "Where the Spirit of the Lord is." We are running our next Alpha course on Tuesdays from March 13 to May 15, 2007. Anyone in the community is invited - bring your friends. For more information or to register, call Lynn at 613-521-5310. Bishop Don Harvey, Moderator of the Anglican Network in Canada, will speak at an Anglican Gathering at St. Alban's Church, 454 King Edward Ave.
PLUS: Are you funny? - Your chance to get on tour with Leland and PROVE it! A great night of fun and faith, outreach and fellowship for the whole family. 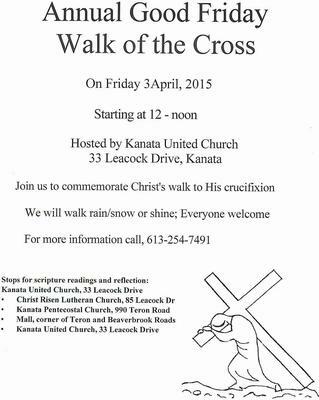 Where: St. Paul's Anglican Church, 20 Young Road, Kanata. Mark Tiller brings to life an early church struggling to live together as a community of faith. First Corinthians is presented in its entirety as an 80-minute, one man, dramatic production. 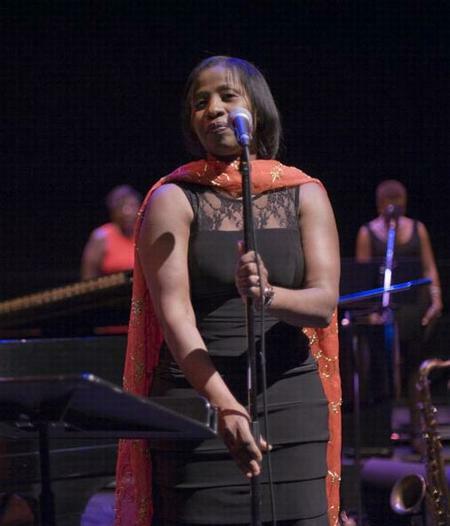 Sun 28 January 2007 @ 6:30 p.m.
A Musical Tribute to Dr. Martin Luther King Jr. Admission: One or more non-perishable food item(s) for donation to the Ottawa Food Bank. Deborah Gyapong's journalism career spans more than 20 years in television, print and radio, including 12 years as a producer for the Canadian Broadcasting Corporation's television news and current affairs programming. Deborah now covers religion and politics primarily for Roman Catholic and Evangelical newspapers. In 2005, the manuscript for her suspense novel The Defilers won the Best New Canadian Christian Fiction Award. The prize included publication. The Defilers was released in May 2006. Tickets are available Sunday mornings or from our Music Director Ann Faurbo. Anne can be contacted via web link below. Cost is $15.00 per concert or $50.00 for the entire series. Jesus Christ Superstar will be presented at the Earl of March High School, with Joshua Masson will be playing the lead role. Ticket prices will be approximately $10 for adults, $8 for children. Preacher, Man of God, church planter, on the front lines of Christianity. Bishop John can come and speak at your church, or to your group. He will speak at St. Paul's, 20 Young Road on Saturday 22 Oct at 6:45 pm, and also after a pot luck lunch at St. Paul's on Sunday 23 Oct. Arrive by 12:30 for lunch. Living Faith course at St. Paul's Church, 20 Young Road. This 10 week course will run from the above dates. Bishop and theologian N.Tom Wright leads video viewers in an exploration of the essentials of Christianity. To register, call Rev. 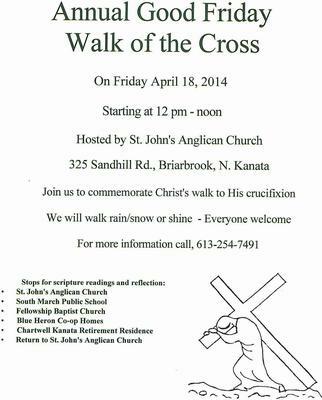 Sally Gadd at 613-836-7272, leaving your name, tel no and church affiliation if any. 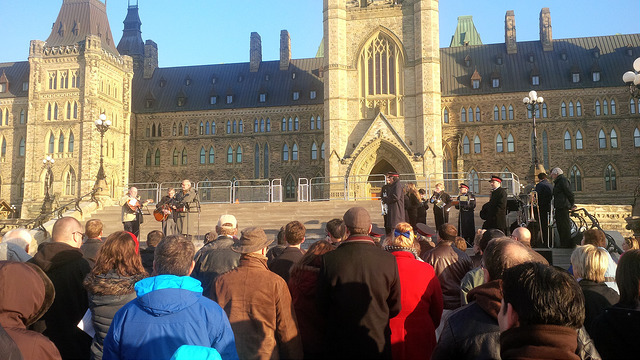 Parliament Hill, in advance of the vote on whether to reopen the debate. Red Friday Rally The wives of two men serving in the Canadian Forces have started a grassroots effort to send a message to our soldiers. The concept of wearing something red - whether a red shirt, jacket, cap, bandana or whatever - every Friday is meant to let the soldiers and their spouses and children know they are not alone. We appreciate the sacrifices they are making on our behalf. We thank them for their service to our country and their fight for peace and justice wherever in the world they are sent. Police officers, firefighters, city staff, politicians of all stripes, OC Transpo staff, paramedics, United Way workers, private businesspeople and the general public will join a colourful parade of veterans as they show respect and thanks in a very public way. Just in time for your fall Alpha Course, a multi-church pre-course leader training session will be held at Bethel Pentecostal church, 500 Viewmount Dr, Nepean, this day from 9 am to noon. This will be led by Tony Copple, based around the standard video training tape with Nicky Gumbel. This will save individual churches from staging their own trainings. There is no charge. This "Equip and Refresh" conference is both for those wanting to know how to present the Alpha Course for the first time, and also for those who are already running Alpha and would like to raise the potential of their courses to a new level. Parliament Hill, all day. No registration. We are gathering as a nation, young and young at heart, to praise, worship and lift a CRY 2 GOD for the fulness of His dominion to come in our generation. Come make HIStory with us! Come and be Renewed in the Holy Spirit! ask or think, desire and dream....To Him Be Glory." wonders, miracles and healings. Prophetic ministry." of others by . . . ‘Being a Sign and Wonder'"
After: Bring your picnic lunch, and listen to a Christian music concert. 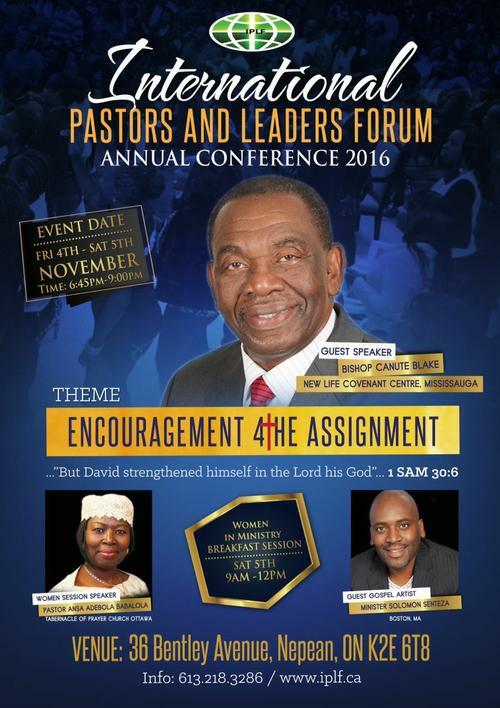 Internationally recognized director of healing ministry to speak at a number of targeted sessions. Purpose: Training youth leaders to deliver Youth Alpha courses. Fee: $75 for adults and $45 for students. Kanata main event day: Sat 10 June, 8 - 4. Kick off at Bridlewood Church of the Nazarene. The Future of The Church - live, groundbreaking telecast. Watch and hear three prominent thinkers discuss the future of the church. With Diana Butler Bass, The Very Rev. Alan Jones, and Brian McLaren. They will share insights, inspiration and advice on how we might live and worship together as Christians. "World's Greatest Mom" celebration, 9:00 AM and 11:15 AM. Bethel Pentecostal Church, 500 Viewmount. Visit this website and enter your mom, telling us why she should be picked as Mother of the Year. Two mom's will be selected as well as others who will be honored that day. Last year we did this celebration on a smaller scale and it was such a hit that a decision was made to make it an all out outreach event. The 2 morning celebrations will be designed to be exciting, relevant, passionate, moving and a very unique gift for all mothers and their families. We will be having music, drama, a children's choir, a beautifully decorated stage, tributes to unsuspecting moms, and the Lapointe family from Fredericton, NB. as our special guests. Join Laurie-Ann Copple at her home church of St. Paul's Kanata to hear the story and see the pictures and videos from her recent mission to Lahore. with Dr Allen Churchill, speaking on "God's Resources for a World in Need"
12:30pm - 2:00: Virtual tour of the Holy land - The 5th annual Virtual Holy Land Pilgrimage walk which will culminate at the cross at Jerusalem in our south field. Easter may never be the same. Bring your own lunch and boots fit for the weather (maybe wet) conditions. In Kanata for "Coffee with Charlie"
Gather on Parliament Hill at 5pm and in the Met at 7 to pray for our (potential) leaders and our nation at this election time. 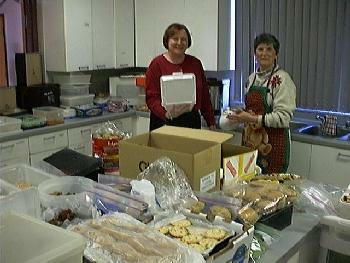 For Food Cupboard clients, shut ins and students who can't get home for Christmas. City-Wide Worship and Prayer present their huge annual event this year in Kanata on Saturday Oct 29 from 7 - 9 pm. 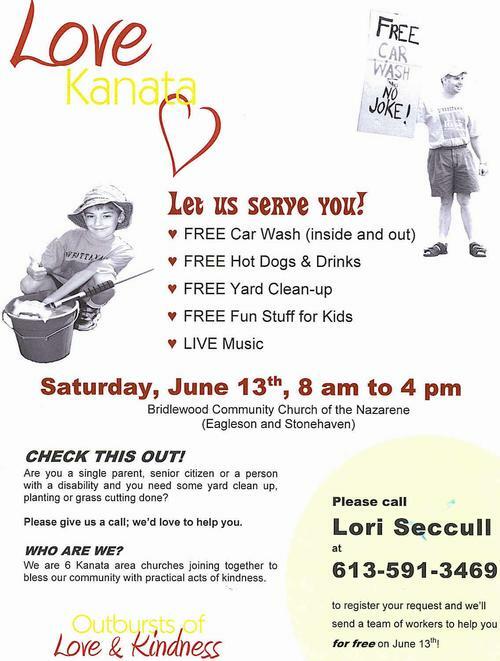 This is a chance for all Kanata to join together in praise and worship. Book your calendar now! Seating for 3200. 15,000 on Paliament Hill took part in the strongest statement the Government has yet seen in defence of traditional marriage. Learn how to be active for Christ in political circles. Join with people from across our region for a time of unstructured, yet directed, worship and prayer. Jody Cross will lead into the Lord's presence with anointed music ministry while Tom White gently guides in prayer on a path of the Holy Spirit's choosing. This is a truly terrific opportunity for outreach to sports fans. Post event follow up will be provided by Alpha. Worshipfest Sonic Flood, Robin Mark, Sonic Flood, Nicole C Mullen, Jaci Velasquez, Out of Eden, The Elms, John Reuben and Pillar are just some of the great Christian bands coming to Worshipfest this year. 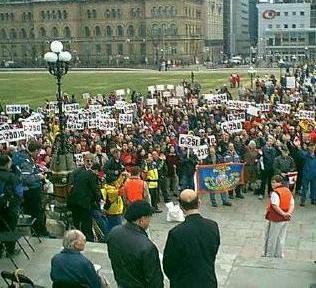 Gathering at 2pm at the Supreme Court, then marching to Parliament Hill for music and speeches. This year's walk started at the Kakulu Medical Centre, 99 Kakulu. About 200 Joined the band of young and semi-young pilgrims as they remembered Christ's passion, stopping for refreshments en-route at St. Paul's, Young Rd. For their September event at Bethel Pentecostal Church, City-Wide Worship and Prayer Ministries had as their focus the Kanata churches, and the plan for a very special communal worship event in Kanata possibly at Pentecost 2004, when instead of regular services the churches will all join together for one huge service. 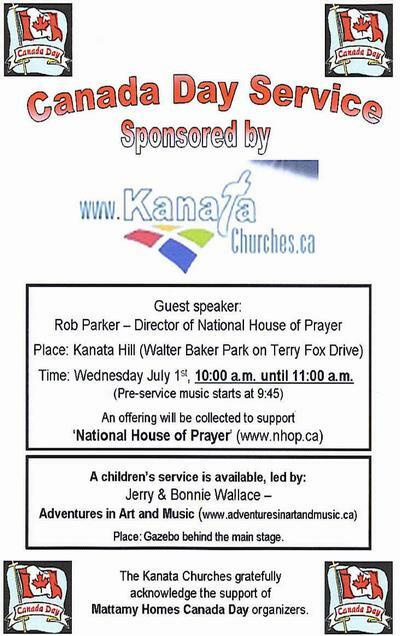 All Kanata congregations were urged to attend this special prayer and praise event, and about 45 did, and had a great time praising the Lord. (The focus of the August event had been the Alpha National Initiative). E-mail events for insertion to Tony Copple with subject line "Kanata Christian event"
For past events no longer listed check source code.